Inside a small hangar, the parts and components of a two-seat plane are starting to come together, piece by piece, built by teenagers, guided by mentors. Alaska Airlines supports these next-generation aviators through a fledgling program that teaches high school students how to build a plane and learn to fly it. Called TeenFlight Puyallup, the nonprofit club matches experienced professionals with kids interested in aviation, supported by donations from the airline. The first aircraft is almost complete, constructed during twice-a-week “build” sessions at Thun Field Pierce County Airport, about 30 miles south of Seattle-Tacoma International Airport. That’s exactly what Alaska CEO Brad Tilden envisioned two years ago when he approached Burdeaux and Teresa Rigoni, a quality assurance auditor at Alaska. Tilden wanted to find a way for Alaska to ignite a passion for aviation in students and give them some hands-on experience building an airplane. During countless volunteer hours, Rigoni fine-tuned Tilden’s vision and researched options for Alaska to consider. When she was introduced to the blossoming group TeenFlight Puyallup, Rigoni knew it would be the perfect collaboration and brought her idea to Tilden. With his enthusiastic approval, Rigoni began laying out the path to today’s Alaska Airlines sponsorship. She and Burdeaux now help guide the program as board members, along with Tilden’s wife, Danielle. 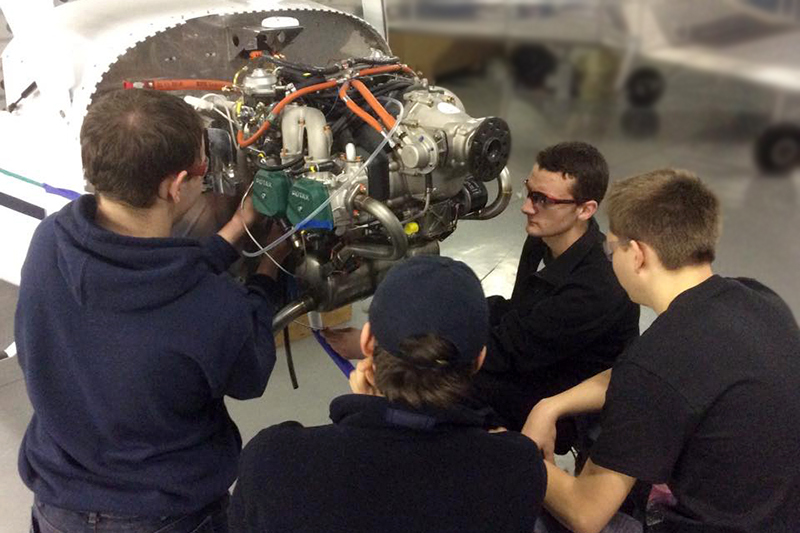 The program is free for students, who learn the basics of aircraft maintenance and receive ground-school training as they work to earn their sport pilot’s license. Students receive their own set of blueprints – almost a foot thick. About 10 mentors, including retired Alaska mechanic Harold “Smitty” Smith, offer their expertise. They’re always looking for more volunteers. Quentin Ramirez was one of those students. Drawn by his love for airplanes, Ramirez started showing up to the build sessions during his senior year of high school in 2013. He’s among a dozen students who put sweat equity into a 20-foot Van’s Aircraft RV-12, an experimental light sport aircraft that’s almost ready for its first flight. For Ramirez, that introduction to airplanes translated into a job with Alaska Airlines. The 20-year-old was hired in April as a technician helper in line maintenance in Seattle. He’s also taking classes at Pierce College Puyallup to earn his FAA airframe and power plant license. “I probably would have gone a different direction if I didn’t have TeenFlight,” Ramirez said. If you want to see their work in person, the students plan to show off their plane during Alaska Airlines Aviation Day on May 16 at the Alaska Airlines Hangar in SeaTac. Once complete, the plane will be used for flight training, then it will be sold to fund the purchase of another kit aircraft – supporting and inspiring the next group of kids who dream of flying. 2 comments on "Alaska Airlines helps students build a plane, learn to fly"
Excellent way for Alaska Airlines to be involved in the community. The future belongs to the youth as time marches on!